Malacanang said the government is doing its job of protecting the maritime environment in the disputed West Philippine Sea. Malacanang ordered the suspension of work in government offices nationwide beginning 12 noon to give public servants ample time to prepare for the Holy Week break. Malacañang couldn't care less about the Catholic Church's endorsement of certain senatorial candidates in the upcoming elections. Throughout the Holy Week, Malacanang said Tuesday that concerned government agencies have been placed on "hightened alert" to ensure safety and security for all. Malacanang believes the Chinese action of harvesting giant clams in Panatag Shoal is "an affront to our territory and to our sovereignty." 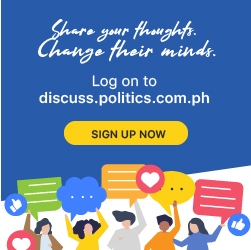 President Rodrigo Duterte did not merely side with the Senate when he vetoed P95.3-billion worth of items in the 2019 national budget, Senate Minority Leader Franklin Drilon said Tuesday (April 16). Malacanang expressed sadness after the Notre Dame Cathedral in Paris, France caught fire destroying a majority of its roof and towering spire. President Rodrigo Duterte vetoed P95.3 billion items of appropriations in the details of Department of Public Works and Highways (DPWH) programs/projects as they are unconstitutional, says Malacañang. Senator Panfilo Lacson has nothing but praises for President Rodrigo Duterte for vetoing P95.3-billion worth of items under the 2019 national budget, which the Chief Executive signed into law Monday (April 15). Malacanang has clarified that President Rodrigo Duterte directly vetoed the provisions on P95.3 billion worth of programs and projects under the Department of Public Works and Highways. Manigas kayo! This was the message of President Rodrigo Duterte to people envious of his pretty aides in Malacanang. The creation of three new Palawan provinces won't strengthen China's position in the West Philippine Sea, says Malacanang. Malacañang clarifies that President Rodrigo Duterte had invoked the arbitral ruling on the South China Sea (SCS) disputed when he warned China not to touch Pag-asa Island. The creation of three new Palawan provinces won't strengthen China's position in the West Philippine Sea, Malacanang said. Malacañang clarified on Monday that President Rodrigo Duterte had invoked the arbitral ruling on the South China Sea (SCS) disputed when he warned China not to touch Pag-asa Island. Aquinos are not power hungry or sore losers. The next Speaker of the House of Representatives must be a true ally of President Rodrigo Duterte, one of the contenders for the position said on Sunday. Being the country’s most powerful person is not what President Rodrigo Duterte thought it would be when he decided to leave Davao City hall and run for Malacanang in 2016.